Through the construction and testing of a solar oven, students will understand the importance of solar energy to the establishment of a lunar base; develop methods to maximize solar power efficiency; and develop skills in teamwork, communication and problem solving. Marshmallows, raw apple slices, or other suitable food to "cook"
Gather all the materials and make copies of the Solar Oven Challenge Student Sheets. Note: Specific construction materials can vary as long as all teams have equal access to materials. 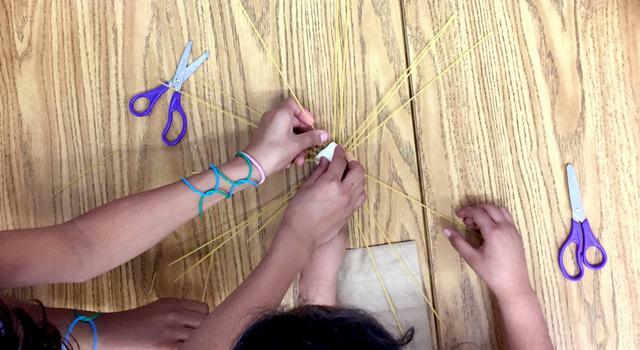 Research indicates that cooperative learning methods -- having students work in small groups -- can help them learn concepts and skills. Using official engineering job titles will enhance the experience. Teams of three or four will work best. If you have three students per team, one will have the combined role of facilities engineer and developmental engineer (see role cards). 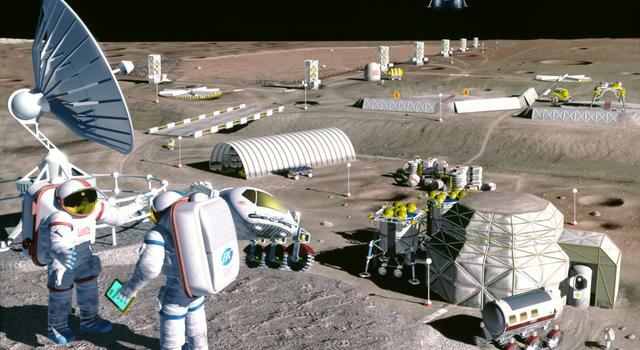 One of the biggest challenges in establishing a lunar base is to supply it with adequate power. Although various power sources have been proposed and are under consideration, there is no question that solar power will play a significant role. Introduce the challenge. The object is to use the available materials to build the most efficient solar oven, able to cook a food item in the least amount of time. Distribute role badges and explain the responsibilities of each team. Distribute Student Sheets and discuss the steps of the design process. Using scissors and leaving the mouth of the container intact, cut away the side of the milk container with the handle. Line the inside of the milk container with aluminum foil. Try to keep the foil as smooth as possible and avoid wrinkles. Untwist the coat hanger and cut a section approximately 30.48 cm in length. Push one end of the wire through the bottom of the milk container using the scissors to cut a hole if necessary. Skewer the food item with the wire and pass the wire through the mouth of the container. Cover the open part of the oven with plastic wrap. Remind students that these are only the directions to build a basic solar oven and they are free to alter and expand upon these plans to make the most efficient solar oven possible. After construction is complete, have all teams bring their oven to a designated area in the sun. Teams should use books and other objects to prop the ovens at an angle that allows them to receive direct sunlight. Teams may adjust their ovens during cooking. The instructor will determine when the food items are completely cooked. The team whose oven completely cooks the food item in the shortest time wins. Depending on the weather and the time of year, cooking times may range from 10 minutes to 30 minutes. This activity works better on hot, sunny days. Discuss the results as a class using the discussion questions below. What role did the aluminum foil play in the solar oven? As the rays of the sun hit the reflective surfaces inside the oven, they will be concentrated on the food item. What modifications from the basic design increased the efficiency of the oven? Plastic wrap traps some of the heat inside the oven. Additional insulation around the outside of the oven, but not blocking the sun, can increase the efficiency of the oven. What modifications did not prove effective? How would you redesign your oven base on the lessons you have learned?